Starters Seafood platter……battered fish, tempura style fried shrimps, sautéed calamari and sauces that made me lick my fingers. Seafood lovers, this is your dream. Remembering the sensation I felt while munching on each masterpiece just made my jaws tingly. The shrimps were my favorite…..light, crunchy and tasty! Chicken bites…..Tender chicken pieces coated in delicious sweet and sour sauce. Simple yet extremely delightful, every bite felt like fun! Mains Beef burger for my dining partner but my throat might have collapsed if I didn’t have a bite…..juicy tender meat with fresh bread buns, what’s not to love? 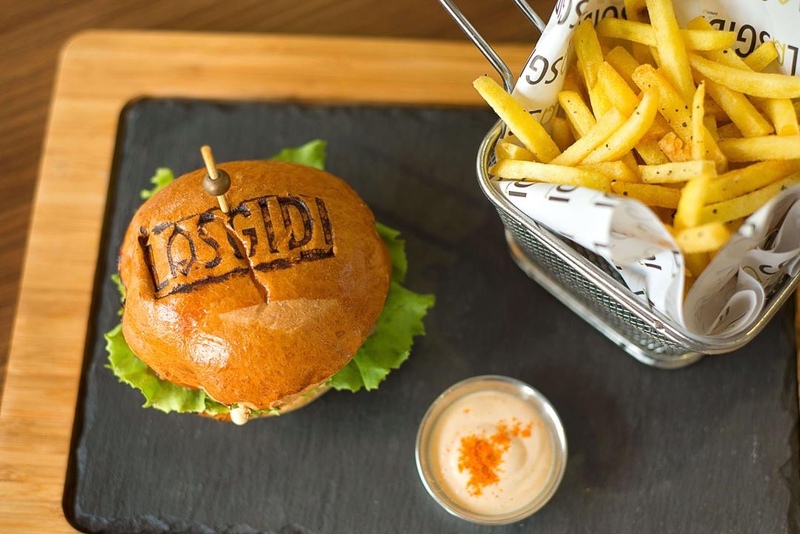 The “Lasgidi” stamp on top was so exciting to look at, I wished we could just eat around it but no, my hungry lion friend had to have it all. Thankfully, I had the bunch of perfectly fried fries to myself. Chicken Alfredo Pasta for me. This was simply a bowl of comfort food……cheesy, saucy al dente pasta. First off, I fell in love at first sight, peep how delicately beautiful those garnish greens are. Then the fact that the chicken was breaded also gave me joy…..slicing into that golden crust was everything and when I bit into each piece, the ultra-juiciness on the inside made me cry tears of joy internally. Quinoa salad…..I was not going to mention this because quinoa is not my specialty but the fitfam community needs to be aware of their options. If you try it out, kindly let us know what you think in the comment section. Drink I had a Lasgidi signature cocktail. This was my first drink after a whole week (very long for me) of staying off drinks and it was truly rewarding. A refreshing mix of fresh fruit juices infused with vodka….. Rolled Icecream If you are a fan of rolled ice cream, Lasgidi does it right and you get to watch the process. I had vanilla ice cream infused with caramel…..Decadence! Address: 237 Kofo Abayomi Street, Victoria Island, Lagos. These photographs are absolutely stunning, I feel like I am there with you!